Buddha Bowl. The first time I heard the name I was delighted. Delighted that somebody had named a dish that. After eating one, I was even happier. It was bright, colourful, nutritious and satisfying. But the real beauty of it is that you can make one pretty much however you want. Follow a few teachings and you can knock up a delicious and varied Buddha Bowl every time. The basic Buddha Bowl consists of a grain, a green and a bean, and is usually accompanied by a tasty dressing. It is so-called as it is usually eaten from a bowl with a wide top – that signifies Buddha’s belly! It incorporates many essences of life without taking life. Of course a Buddha Bowl is always vegetarian, and usually vegan. Because of the combination of grains, greens and beans you’re getting a bowl full of complete proteins – all the essential amino acids that your body can’t make alone will be provided. This meal also takes care of a whole host of macro and micro nutrients too, determined more precisely by the combos you pick. We’ve put together this guide to make sure you get your buddha bowls right every time – easily and without fuss, just the way it should be. Part 1: Grab a grain and prep it most deliciously. 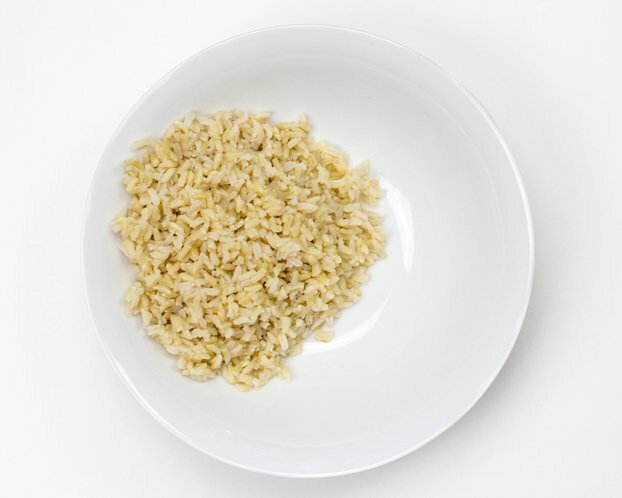 We’re going to focus on rice to begin with here for simplicity’s sake – rice is a really easy way to start – and there are so many beautiful variations available. There are many alternatives (and although not all of them technically grains) you can also use quinoa, millet, freekeh, buckwheat, barley or couscous – whichever you like the most, suits your budget, or is the easiest for you to find at your local store. To really enjoy your Buddha Bowl you need to learn how make your grains taste awesome. If they are bland you won’t enjoy the dish. Rinse the rice in a sieve (optional but great if you can!). Add the rice to a pot. Add water and salt, bring it to a boil. Pop the lid on top and put it on low heat for 8-10 minutes. Check back when the time is up, fork through it to make it fluffy. Optional but even more awesome: leave it for another 10 minutes to let excess moisture evaporate. 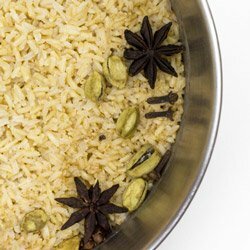 Make sure to give the rice some extra flavour with spices and herbs! Version 1: Indian Style – pick and choose from the spices below; experiment a little and see some exciting results! Add them to the rice as it’s cooking. Version 2: Cilantro Freshness – you can use any herbs you like but we love this version in particular. When the basic rice is cooked stir in a handful of chopped walnuts, a handful of raisins or dried cranberries and a dash or two of balsamic vinegar. Don’t worry if you don’t have all the ingredients to hand, throw in what you do have! Rinse the rice in a sieve (optional). Add the olive oil to a pot and put it on medium heat. Next add the rice. Let it fry for a 2-3 minutes while stirring every now and then (if making the Mexican version then add half an onion, half a bell pepper and the tomato). Add water (or broth) and salt, bring it to a boil. Then stick lid on top and put it on a low heat for 20 – 25 minutes. Check back when the time is up, fork through it to make it fluffy. Optional: leave it for another 10 minutes to let excess moisture evaporate. 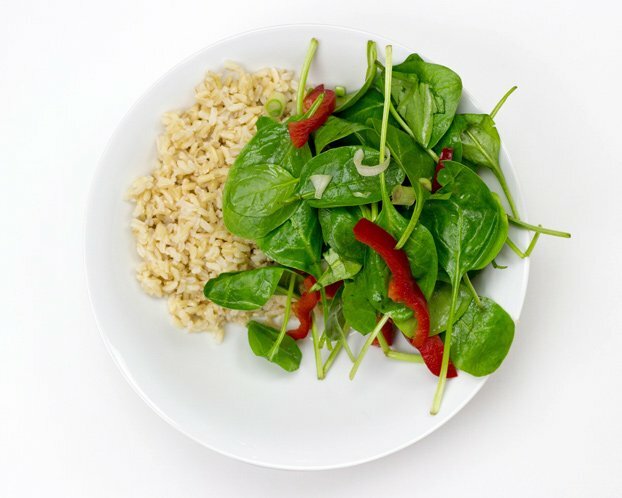 Check out this post by The Kitchn for an even more detailed explanation on cooking brown rice. In a saucepan, combine coconut milk, water, honey, and salt. Stir until sugar is dissolved. Stir in rice. Bring to a boil over medium heat. Cover, reduce heat, and simmer for 18 to 20 minutes until rice is tender. Play around with the spices and liquids, add different herbs before serving, there is no right or wrong – that’s half the fun of a Buddha Bowl! Making good rice is a craft, and you’ll improve with every batch. Remember we said you can use other ingredients like couscous or quinoa too? Well, we weren’t joking! Trying subbing the rice for one of those – you can use the variations from above too. Also if you’re in a rush then you can simply cook the grains in stock instead of water for an instant flavour hit – this is one of the very fastest ways to make a Buddha Bowl! Part 2: Pick a veg and prep it the awesome way. Now your rice or chosen grain is merrily cooking away, it’s time to get the ‘green’ ready. The green is going to be some delicious veggies and/or a leafy green that compliments what you’ve made so far. The key here is to create something tasty with a few simple ingredients. Some evergreens are spinach, kale, cabbage, cauliflower, broccoli, asparagus, mushrooms, bell peppers, carrots, tomatoes, cucumbers, zucchini, onions, sprouts, avocado and spring onion. But once again, there are no right and wrongs with this versatile and beautiful dish we call a Buddha Bowl. Here we use bell peppers, but you can use whatever you’re in the mood for – or happen to have in the fridge, begging to be used up! Cut the peppers in thin strips (“julienne”). Check out this video for some cool cutting edge cutting tips. It’s funny too. After a few giggles heat the olive oil in a large nonstick pan over medium heat. Add the bell peppers and onion; season with salt and pepper. If you have one, add a lid on top to keep in the steam. It’s not classic sauteing, but it helps to soften the veg more quickly. Stir occasionally! When the bell peppers are soft (after about 10 minutes) add a splash of balsamic vinegar. Devine! Here we use lettuce, carrot and rocket but you can use whatever raw veggies you like. There’s no cooking to be done here, just a bit of prepping. To save even more time you can use a bag of mixed salad. Not much to say here – rinse the ingredients, peel and grate the carrot (unless it’s organic, then you can eat the skin), chop the lettuce. Done. One of the easiest and most nutritious ways to cook veg. Sounds exactly like it is. Once again, use your favourite veg, or simply what you have to spare. Here I’m using a couple of different veg with different steaming times to give you an idea of how it goes. Bring about 3 cm of water to boil in a saucepan. Place the equally chopped broccoli in a steamer bowl (a metal sieve works fine too!) and place it on top of the boiling water. Cover with a lid. Note – the veg should be above the water, not in it. After about three minutes add the spinach and let the steam finish its job. Another three minutes should do it, and you’ll have some beautifully tender veg ready for your Buddha Bowl. The above instructions are just an example – you can use whatever vegetables you want! Bear in mind that each veg takes a different length of time – you don’t want soggy greens! This post has a great list of veg steaming times. To test a veg to see if it’s cooked, just poke it with a knife in the thickest area. If the knife slides in easily, it’s ready! Part 3: Choose a legume and ‘av it the way you like. 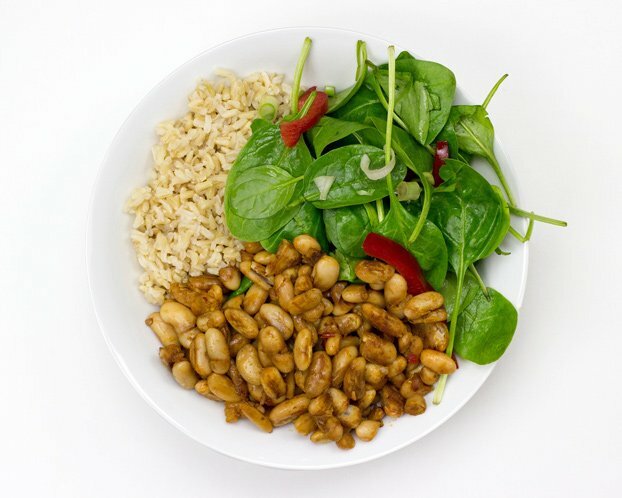 Legumes give our Buddha Bowl a big protein punch. Think black beans, kidney beans, white beans, black eyed peas (not the band, obviously), chickpeas, red lentils, brown lentils, peas, edamame. Also tofu, seitan or tempeh are great too! Usually it makes sense to just use canned ones for convenience reasons. If you already have some cooked legumes in the fridge then that’s just fantastic! 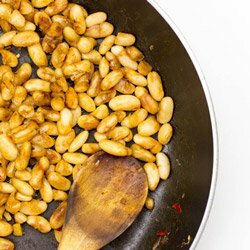 Here’s how to make your legumes really tasty. Legumes usually taste awesome when just drained and rinsed out of the tin. You can pimp them a little with lime, salt, pepper, some olive oil and/or herbs. Then just add them as they are to your Buddha Bowl. It’s the quickest and simplest way. Alternatively: If you saute veggies then add some legumes in the last 2-3 minutes of sauteing. Done. For a Buddha Bowl truly bursting in flavour here are some extra mouth-watering ideas. Grate or chop the garlic and ginger. Then fry both in oil on a medium heat and in a large saucepan for a minute. Drain and rinse the beans, then add them to the pan. Fry for a couple more minutes, adding a couple of tablespoons of water as you go. Finally, remove from the heat, add the salt, pepper and lime juice. You can mash the beans a little if you like. Fry the garlic in oil on a medium heat and in a large saucepan for a minute. Then add the green beans to the pan. Fry for a couple more minutes, adding soy sauce and sambal oelek and optional ingredients as you go. Done. Slice the tofu into cubes, a little bigger than a regular die. Get a pan and fry the cubes in oil on a medium heat for about 15 minutes until golden brown. Stir occasionally so they won’t stick to the pan. You might have to add a little oil every now and then. Make sure to season them with salt while they’re still sizzling! Place all the ingredients in one large bowl and mix until chickpeas are all coated. Place in a baking tray and put in a pre-heated oven for about 15 minutes at 200°C/400°F. 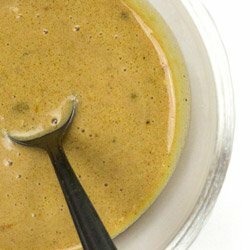 2 tbsp curry paste – think red, green, yellow, tandoori, tikka – use your fave! Optional: A squeeze of lime if you have it. Much like above, mix all the ingredients together and coat the chickpeas evenly. Either place them in a baking tray and roast in the oven as above, or fry in a pan on a medium heat for about 8 mins for a slightly crispier option. A fancy dressing is not always necessary, especially if you’ve already pimped all the other ingredients. If you want to keep it simple, just opt for some sambal oelek, sriracha, soy yogurt or the good old combo of vinegar, olive oil, salt and pepper. Optional: A couple of chilies if you want it spicy! Roughly chop the bell pepper (minus the core and seeds), and add it with the rest of ingredients to a blender or large bowl and blend! A hand blender works really well for this. That’s it, sauce ready! How to Make a Buddha Bowl - The Definitive Guide. 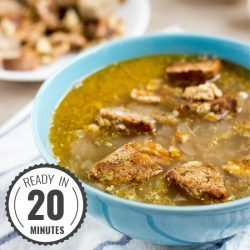 An incredibly satisfying meal - made the way you want, + 20 of the best belly filling recipes out there! Add everything together in one bowl. For the dressing try sriracha, soy yogurt or a combo of vinegar, olive oil, salt and pepper. As we mentioned (once or twice), part of the joy of a Buddha Bowl is doing it your own way. Experiment, have fun and try out different harmonious flavour unions. Mexican style couscous, 1 yellow bell pepper and 2 spring onions (chopped, raw), raw kidney beans and splash of sweet and sour sauce. Indian style rice, steamed spinach and curried chickpeas. Sweet and crunchy couscous with fresh salad, a dash of your favoured sauce. Mexican style quinoa, sauteed bell peppers and red pepper sauce, eaten cold. How long do certain ingredients keep fresh in the fridge? So, cooking up multiple servings of grains or having a half emptied can of beans is not a problem at all. Just refrigerate them and make another Buddha Bowl within the next couple of days. Easy. Right then, you now know the basic tips and tricks of building a proper Buddha Bowl. After all it really comes down to your creativity. Just follow the basic construction ideas and you’ll be making feast after feast. Did I leave anything blurry? (Ah Blurry, there’s a great song I haven’t heard for ages!) Just pop any questions in the comments and I’ll help however we can! We’re always eager to hear any food related story – have you made a Buddha Bowl before? What “grain, green, bean combo” did you go for? And finally – If you’re still thirsty… or even hungry for more inspiration, check out these 20 Buddha Bowl recipes. Not all of them follow the “rules” of this guide, and some of them take longer than the usual 30 minutes you’re used to on our blog, but they’re all awesome…and vegan too! Sweet Spicy Asian Brown Rice and Pineapple Bowl – Yep, this is as exciting as it sounds! Simple Vegan Burrito Bowl – Satisfying and Mexican! Veggie Rice Buddha Bowl – With a lemon herb sauce, cool! Chili Orange Veggie Bowl – Steam your veg! Rice Bowl with Sorrel, Kale, Lemon and Radishes! Fall Buddha Bowl with Quinoa – Comforting and healthy! Rice, Black Bean and Avocado Bowl – With a Sweet Chili Mustard Sauce! Sesame Garlic Buddha Bowl – Love the flavours!! 15 Minute Buddha Bowl – This one is fun to eat! Buddha Bowl with Red Pepper Sauce and Roasted Chickpeas – Wow! 30 Minute Black Rice Buddha Bowl – Plus lots of veggies! 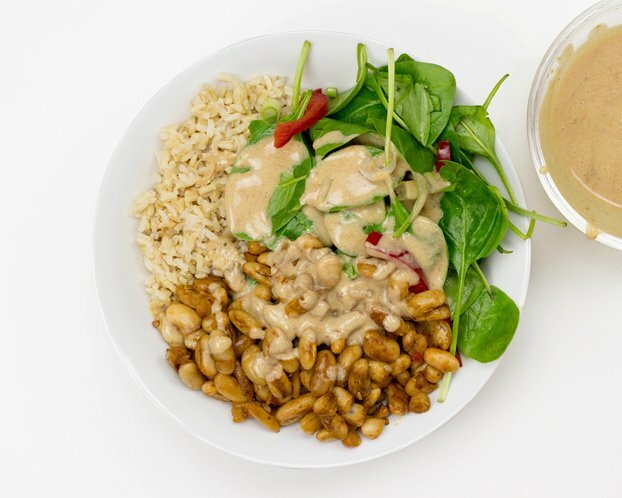 Colourful Buddha Bowl with a Tahini Lemon Sauce – Sounds amazing, right? This post is awesome! I love how versatile the Buddha Bowl is and you gave so many great options! I want to run into the kitchen to make one right now! I love this tutorial about how to make a buddha bowl! I’ve never had one myself, so this was very informative. Love all the variations too! Then you’ve really got try one! You won’t regret it, that’s for sure! I LOVE the Buddha bowl. It’s one of my favorite lunches. So many great options and now I have your list to work through. Thanks! You’re very welcome – hope you enjoy them as much as we did! i have never tried ‘Buddha Bowl’ per say but my dinner almost always some form of Buddha bowl coz its so versatile, easy and nutritious!!! What a great post! I love how customizable Buddha Bowls are. I eat one at least 2 or 3 times a week. This is such a great post! I could eat a Buddha bowl every day. Thanks for sharing my recipe with all of these delicious bowls. I love the formula you came up with 🙂 I was always very intuitive with creating my bowls but it’s great to have such a blueprint on hand! Oh, okay! 😀 Now I know what’s going on with Buddha bowls! The lunch I just ate was accidentally a Buddha bowl, and I feel so fresh and hip now that I know. 😀 This is an awesome tutorial, seriously! Clever, entertaining and very helpful. You’ve given me the courage to start creating Buddha bowls of my own, on purpose! I always love you step-by-step guides. I’ve made a buddha bowl twice in the past month, and neither was exactly what i was going for, but this sounds perfect. saving it for the next picnic! This is my favorite thing to make!….at the Whole Foods salad bar lol. Thank you so much for posting this! Now I feel like I can work toward making my own. Thanks so much for including me! I love the detail here, it’s seriously amazing! Will definitely be sharing. You’re welcome Jessica, glad you like the post. It’s been quite some work, yes 😉 Thanks a lot for spreading the word too. What about Jesus bowls? What’s in them? will definitely share! And LOL on the Jesus bowls…I want one of those! Ohh, I know I mentioned it in the group but I might have forgotten to tag you! Thanks for this informative, user-friendly post. I am leading a group through a week of whole foods and will share this with them. 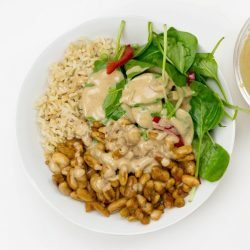 What sauce would you recommend with the Indian Rice/Roasted Chickpeas bowl? I love curry, and I’m afraid the peanut sauce would overpower the curry flavor. I am also a wimp when it comes to spice! Hmmm, Indian rice, roasted chickpeas – maybe with a salad and a tasty vinaigrette? 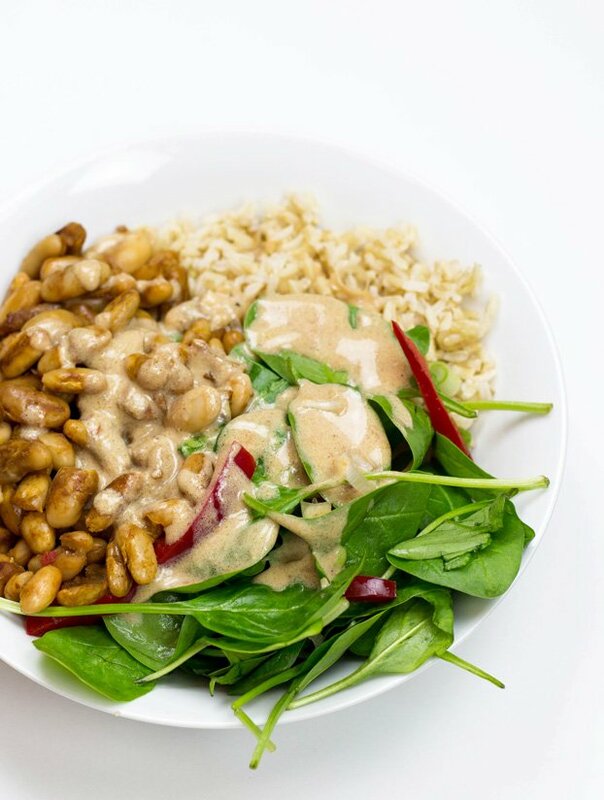 You’re right – the peanut sauce might be a little overpowering, true. No worries Howie! We’re gonna give the red pepper sauce a go tonight. We’ll see how it goes! Thanks! Thank you so much for this post, I have recently become vegan and I can’t believe how tasty this is. 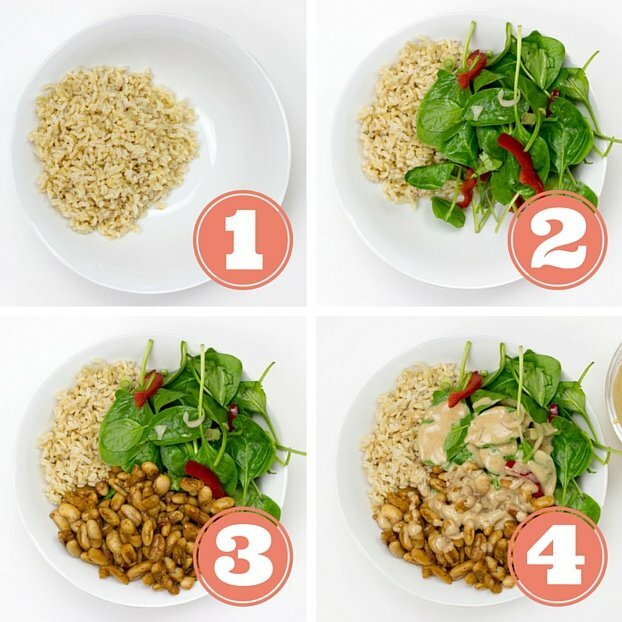 I tried the peanut dressing and it was AWESOME! I looooooove the peanut dressing too Tanya! From the very first time I tried it, I was blown away – and even after nearly three years I still have it every week or so in one form or another :). You’re very welcome for the post, thanks for your lovely comment! Curious to know if the beans, rice and sauces could be made in bulk then frozen… How would one go about doing this… and, what is a ‘rocket’? Hi there! Yep that would be possible, indeed! In fact I do that myself quite often. In regards to beans: I only see a reason to freeze them when you cook up dried ones. 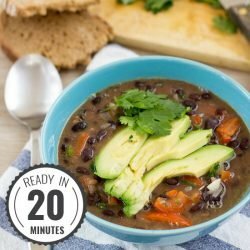 Beans from a can are super quick to prepare, I don’t see why you would want to freeze them. Here is what I do: recently I purchased an instant pot that allows me to cook dried beans within 45 mins. I let them cool and then freeze them in 2 servings containers. Regarding rice: I do exactly the same: 7 minutes in the instant pot, then freeze 2 servings per container, done. When you say “instant” pot, do you me an a pressure cooker? Hmm, I just checked myself how to print this post and found a great solution to get rid off the “online clutter”. Are you using the chrome browser? If yes, search in google for the chrome extension “Print Friendly & PDF”. It’s free and creates really clean pages to print out! If you use a different browser i’m sure there are similar extensions. Hi Penny – then I feel very privileged that you’ve left a comment here, thank you. Yes, Buddha Bowls are awesome, so many choices and so many ways to make them. 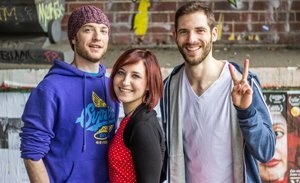 Have fun – and enjoy! This is just what I’m looking for!! !love all the options. I’m in my kitchen now prepping fto entire week. Thank you! This is gold. I’ve been packing a Tupperware with steamed rice and a rotation of pretty much the same 5 or 6 veggies and hot sauce for lunch every day. I need flavor, and lack kitchen creativity as well as most ingredients in a lot of vegan recipes. This is going to be a game changer. Thanks! Thanks for this wonderful post. I don’t cook a lot and I feel guilty because I have a wonderful husband who cooks all the time. I want to make food for him. Going to the store to buy the ingredients to make a Buddha bowl! Probably the super simple vegan burrito bowl. We LOVE avocado and cilantro so this is great. Love black beans too! LOL I may cheat and use oil & vinegar though because we love that just fine.